« Tuesday’s Topic: SOAR Zip Lines – Fly Above the Pines! A beautiful weekend is in store for Big Bear Lake with sunny skies and temperatures near 80°. We have a chance of afternoon thunderstorms beginning early next week, but at this time the weekend looks to be dry. 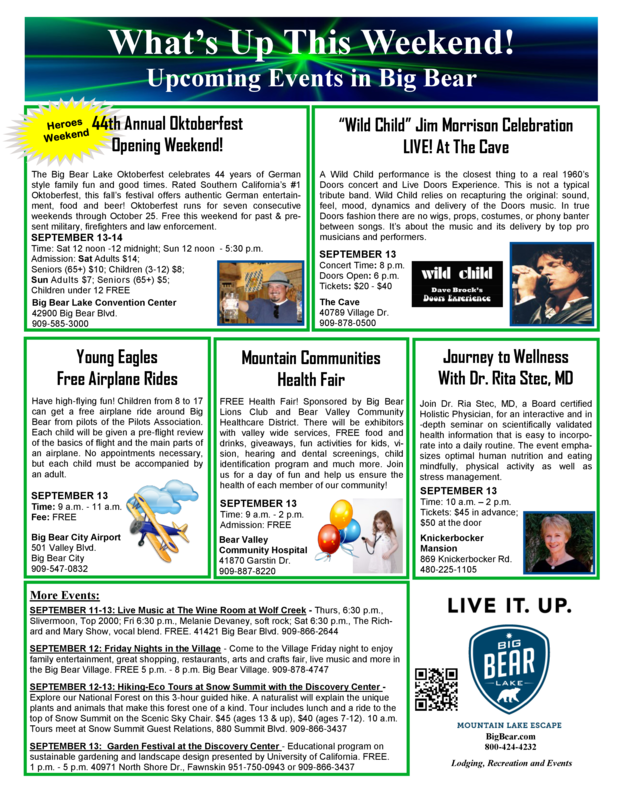 Willkommen to the 44th Annual Big Bear Lake Oktoberfest! The fun begins this Saturday and opening weekend is American Heroes Weekend with FREE Admission for all past and present military, law enforcement and fire fighters. Did you know that RS Vacations offers a 10% Military Discount on all of our rental cabins? This weekend is the perfect time to make a last-minute trip to Big Bear and take advantage of these special deals! Visit us at RSVacations.net and book a cabin today!